I met up with hotelroomauction.co.uk at World Travel Market last November but they kept slipping off the ‘to write about’ list. Better late than never though! hotelroomauction is the UK spin-off of a Dutch website, hotelkamerveiling.nl, which has been in business since 2007. The company has over 700,000 registered members, receives 1 million visits per month to the Dutch site and has booked over 3 million rooms. It is a simple platform which allows you to bid on hotel rooms in cities around Europe. In general, hotels offer 2-day packages, including breakfast, for two people. Most auctions are for weekend stays and your voucher is valid for 12 months. Blackout dates are shown in each listing. As well as an auctioned lot, the site also makes the same packages available for a direct cash payment. I imagine this is how the site makes the bulk of its money. The company works with the big hotel groups as well as independents. At the time of writing, the home page includes offers from Crowne Plaza Rome St Peters and a Radisson Blu in Brussels, although those auctions will be over by the time you read this. The company brochure lists Wyndam, IHG, WorldHotels, Best Western, Ramada, Carlton and Campanile among the chains it works with. There is also a longer list of ‘members only’ auctions which can only be viewed if you are registered, which are used by hotels who don’t want to be seen to be publicly discounting. The home page is here if you think the concept sounds interesting. A hotel executive with a major UK group told me recently that she isn’t primarily bothered about other chains these days. What keeps her up at night is the behaviour of the major online travel groups, primarily Expedia and Priceline / booking.com, who between them pose a far bigger threat to her profitability. If it is bad for the chains, think about what life is like as an independent hotel, even a successful one. This is why we have seen the rise of Marriott’s Autograph Collection, the Starwood Tribute Collection and Hilton’s Curio Collection. These groups – of which only Autograph has critical mass – allow independent hotels to be bookable via the website of a major chain and gain some ‘protection’ in rate negotations with the online travel groups. In return, they pay a fee on every stay to the chain (to fund marketing, loyalty points etc), must honour – usually in a watered down form – elite benefits and must make rooms available for points redemption. What the hotels do NOT have to do is meet any service standards. As Hyatt website says, it ‘works closely with our owners and operators to encourage a Hyatt standard of excellence’ – with the key word being ‘encourage’, not ‘mandate’. Hyatt’s entry into this space is called the The Unbound Collection. It launched last week with three hotels – The Driskill in Austin, the Carmelo Resort & Spa in Uruguay (which used to be a Four Seasons I think) and the Hotel du Louvre in Paris (photo above). The latter is, of course, the most likely to be of interest to Head for Points readers. 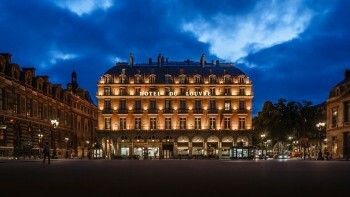 That said, Hyatt is already well represented in Paris via a Park Hyatt, a Hyatt and a Hyatt Regency at Charles du Gualle. A quick look for a random night in May turned up a rack rate of Euro 490 or 20,000 Hyatt Gold Passport so the Hotel du Louvre could be an interesting redemption option. Hyatt will need to start bulking up the property numbers soon, however, if this is not to turn into a damp squib. If you wanted to visit the Hotel du Louvre for cash, Hyatt Gold Passport members can stay three nights for the price of two between 1st April and 30th June. This requires rate code FREE3 on hyatt.com. The same deal works for the other two Unbound hotels as well. Is hotel room auction really so honest? The auction counters are repeatedly counting down from 5 minutes to zero and then resetting to 5 minutes again with the same high bid in place. OT bits: I have received emails from Etihad in past week with 2250 bonus points for joining/subscribing to asmallworld (any up to date info on this network Rob?) and 1000 bonus miles for joining Heinemans shop loyalty scheme which seems to be free. It does seem to be free, and this is a wide promo as even existing Heinemann members can get the Etihad Guest miles for linking their Etihad Guest account. Heinemann also send me a €10 voucher every year on my birthday! I got the ASW email. ASW has changed massively in the last couple of years and, for better or worse, bears no relation to what it used to be (ie a social network for people who went to public school). Not sure what it offers for your $75 these days. Searched it and feedback suggests it is useless. HfP almost certainly provides much more, and it’s free! Having said that, any thoughts about a premium paid for HfP element with added benefits going forward, for example something along the lines of milepoints premium that had the great HHonors gold included for $50 a few years back? But no-one paid for that for the end product, they only paid for it for the one-off status benefits – and that is not the sort of sustainable I want. Looks like my question was answered by today’s article! Initially read this as ‘hotelroomaction’ 🙂 think that’s a different site…! OT Anyone having problems signing in to the Curve app. I tried to sign in on Sunday AM and was informed I had input the wrong password I then clicked on the forgot password 13 hours later I received a 6 digit code which I entered of which only 4 will register the last 2 keep dropping off when moving to the next step. I have sent email to CS but no response as yet. Still on curve…..is there a cooling off period? Can I cancel or at least change to the cheaper version? I am thinking it is not as good as it sounds. I am also happy with super card and don’t want their 1% FX fee (have free card for that). Sure you could switch or cancel if you email them. You would get the legal 14 day cooling off period for any UK online purchase. gut feel, what would you go for Raffles, the £75 or £35? The worry for the £75 is they still don’t have the rewards programme ironed out. It is really £65 vs £25 because of the £10 back – I would strongly recommend taking the £35 version, unless you want the Tumi card wallet. Look forward to reading your upcoming interview with them to see what they say about the Black card – if not enticing then might downgrade from it! Sorry to sound silly. What is thesupercard? What benefits does it have compared to the curve? Same type of thing, but no comission on forex, and can’t be used with a credit card in the UK, or with Amex at all. It is also not currently available. But watch the site for news. Just received email from Supercard. Pilot cards will stop working 7 June with a full launch “this summer”. Not convinced that hotelroomauction is all that legit… Just logged in for the very 1st time, registered a new account linked to to my Facebook profile and apparentely I’d already “won” 2 auctions in the last month and owe £174. They are a very well regarded Dutch business, it seems, and if you’d seen them at World Travel Market you would have no concerns on that score. The website could do with a refresh though. I’ve also noticed that the “auction” keeps recycling at the same bid price every 5 minutes once the counter reaches zero. For example, there is currently a Brighton hotel shown at £85. It may well be a very reputable business but I wouldn’t touch an “auction” like this. Might this suggest nobody has bid for the hotel and £85 is the minimum bid allowed? ?